How long have you worked at Centro? Best part of working at Centro? Ron Zacapa 23 Year Rum over 1 large cube of ice. Tough question. I like trying new drinks, especially signature house cocktails. If there aren’t any signature drinks I’ll just go Dealer’s Choice or something on the rocks. If you could add any item to Centro’s menu, what would it be? At work or at home with my wife and dog. Hosting the Partida Spirit Bird Challenge on Cinco de Mayo 2012, which also happened to be my 30th Birthday. Sopa Seca –it’s like the McRib, it’s only around for a limited time and then it’s gone. My girlfriend, at the time, was a bartender and she was quitting to focus on a 9-5, she recommended me as her replacement, trained me well, and now we’re married!!! What are the personality keys to a good bartender? What are the key skills a good bartender needs? First and foremost, GREAT guest service. Without our guests we are nothing. How important is it for a bartender to understand spirits, beers, and wines? It’s probably #2 on my list of key skills a good bartender needs. Proper product knowledge allows the guests to trust us and let us guide their experience. What is the one mistake you see young or inexperienced bartenders make? Many young or inexperienced bartenders believe that stronger is better. This couldn’t be further from the truth; balance is the key in cocktails, just as it is with wine & beer. Is there anything in the industry today that you are excited about? Funny you should ask; I just submitted a petition to form the Sacramento Chapter of the United States Bartender’s Guild. There is such a strong community of bartenders in Sacramento and it is time to recognize and support that community. I will be doing a lot of work as VP of the Sacramento BG to organize more educational opportunities, community outreach, and overall advancement of the bartending craft in Sacramento. What did you do before you were a bartender? What have I not done… College Baseball Player, File Clerk, Baseball Coach, Server, Account Exec, Tax Clerk, AP/AR, Student Teacher, the list is too long. 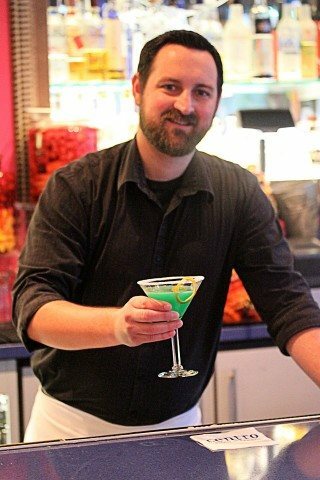 Do you consider yourself a bartender or mixologist? And what’s the difference? Bartender. There is so much that goes into the craft of Bartending. Mixology is just a fraction, true it’s the glitz and glamour and it’s what you hang your hat on, but if all you are is a mixologist, then you’re missing the point. What are some of the most unusual ingredients you have used in making a cocktail? I don’t find ingredients to be unusual as much as exciting. Seems like every time I think I’ve found an unusual ingredient some other ‘cocktailian’ has already tweeted about using it in a new cocktail. If I had to pick one I might say bacon fat to fat wash a bourbon, but everybody is doing that now so it’s not unusual. If you could pick anyone to be your bartender wingman/woman for one night (dead or alive), who would it be? My wife, Lindsey. We have worked together before and it is so much fun. It doesn’t feel like work and the guests really dig the energy we have together. A dog (or a cat). It’s important to have someone awake to greet you when you get home at 4am after a shift.